Brave: Is the Best Part the Larger Conversation? Note to anyone reviewing Brave: the phrase “hits the target” has already been used. A lot. Don’t do it. Also unbearable puns. No. I don’t think I’ve ever left a movie feeling quite so confusingly neutral before. I spent the larger part of Brave playing a sort of mental ping pong, bouncing between disappointment or annoyance and hope or delight. There were moments when my friend Megan and I laughed aloud and others where we cringed. I could call these feelings ambivalence, but it’s more like all the things I liked were perfectly countered by other issues. After all the hype and months of hoping Brave would live up to it, the movie is just kind of mediocre. UPDATE- Check out this article too: Slash Film: 15 Reasons Why Brave Doesn’t Feel like a Pixar Film (thanks, Megan!). I wonder if the best part, then, is the larger discussion the film has opened about the portrayal of heroines in children’s movies. This question has been active for quite a while, but the production of Brave has possibly given it a bigger spotlight and a concrete example of the possibilities and pitfalls of creating dynamic female characters, especially in a market so controlled by passive norms of femininity and the whole pink princess culture. I’ll return to this conversation shortly, but first, a drive-by of my specific thoughts on the film. 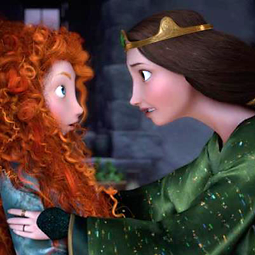 What I appreciated about the film most was the relationship between Merida and her father, Fergus. He sees her for who she is and seems to think she’s a fun kid. He’s warmly proud of her. But the relationship, like in real life, has flaws. He doesn’t listen to everything she says,which leads to very King Tritan moment on his part and later a sword fight between the two. Yes. I also found the mother-daughter tension compelling in the way that mother-daughter relationships tend to be strained at one time or another (called puberty). It was interesting at a human-interest level. When Merida’s mother turns into a bear, the ladylike queen in the body of giant brown bear was pretty visually funny. The evolution of the relationship is the biggest plot of the film and I actually like that in the end, if she’s accomplished anything substantial, Merida’s freed her mother from the pressure she was under to make Merida queenly and uphold tradition. I also thought the moment when she literally went all mama-bear was pretty cool, but (spoiler) no one ever points out that the queen kills the bear that the king has been telling tall tales about taking revenge on for a decade. Come on! On the other hand, I’m pretty sure this film should have been called Humble. The lessons learned are not about finding courage. Everyone seems to be brave to the point of pig-headedness. Instead, Merida and both her parents have to learn to bend their own wills for the good of the community, admitting that they might not actually be right all the time. The grand adventure we all hoped for turned out to be an adventure in little more than family dysfunction. The magic was not a symbol for finding strength within, it was the source of petty conflict. Finally, Merida being a princess was wholly unnecessary, as was the marriage plot. There are so many circumstances that could have given rise to a similar tale. Have a little imagination, Pixar, or just admit you did it for marketing. Their feature discusses the conscious decision to make Merida a princess: “[Producer Katherine] Sarafian says Pixar actually experimented with making Brave‘s main character, Merida, not a princess at all. ‘We tried making her the blacksmith’s daughter and the milkmaid in various things,’ she says. ‘There [are] no stakes in the story for us that way. We wanted to show real stakes in the story where, you know, the peace of the kingdom and the traditions are all at stake.’Now, you’d think someone could find stakes in the story of a blacksmith’s daughter or milkmaid, but apparently not Pixar (which is owned, of course, by Disney). Still, Pixar didn’t seem to have the same problem with ordinary civilian boy heroes in movies such as Up.” Point NPR. One of the major elements of the princess craze that bothers me is the economics of princesshood. Although princesses can have “everygirl” qualities or represent moral lessons for little girls, on some level they have more power through both status and capital than the majority of girls could ever hope for and the princess stories rarely touch on that reality. When they do (as in Jasmine), they do so unsatisfactorily. I kept waiting for some moment in which Merida’s status would have some critical importance in the story making her princesshood necessary to the plot. It never came. At most, her status seems to grant her a self-importance and pride that is not uncommon to adolescent girls anyway. Sure, she’s being betrothed, but non-princesses deal with that too. Bringing the kingdom to the brink of war wasn’t that important to the story, or could have been accomplished other ways (as in Mulan). She consults pink princess expert Peggy Orenstein: “‘It wasn’t clear to me what her arc was,” Orenstein says. ’What is it that we are imagining girls moving toward here? ‘I get to ride around on a horse all day’ isn’t really enough. That isn’t going to take her anywhere. There wasn’t a desire to do something. '” (Time) Essentially, Merida’s story is selfish. She’s not trying to change the kingdom or fight for anyone but herself. In the end, she gets what she wants, but, as Orenstein points out, she hasn’t really done anything. I hold to my prior argument about freeing her mother, but even that victory means little if you factor in that her mom is the queen and has no shortage of power, wealth, or status. It’s a very shallow victory. In a culture that already portrays girls as shallow (just turn on the TV), I can’t count that as a victory for girlhood either. Think about Merida in comparison to Russel from Up. That pudgy little boyscout helped an old man save his home and come out of the depths of grief. And he did so through haphazard human decency and kindness. It doesn’t take superpowers or a bow and arrow to be an empowering character. Pols writes, “Cultural equality is essential to broader equality. The images we see don’t have to be idealized and role models. They don’t need crowns. Average sorts of girls being represented in and incorporated into stories as leading characters can and will empower future feminists. And it’s just as crucial for those who might never call themselves by that name to see themselves on screens, large and small, because they still need to get jobs and find their way in the world.” (Time) So what if Russel had been Rachel, an ordinary little girl who goes on an adventure in a flying house and helps an old man find his way home (metaphorically and literally). That would have been more satisfying (than Brave), I think. I’m actually not trying to hate on Brave. It was an okay movie. But let’s remember a couple of things to take away from the long-running conversation about this film. 1) Brave is only under the microscope because there is a problem. If there had long been female characters in popular children’s movies who were active and central and demonstrated a wide range of qualities and flaws as the male characters do, we wouldn’t be having this conversation in the first place. (Homework: Go watch Miyazaki’s Nausicaä of the Valley of the Wind. She’s still a damn princess, but way cooler than Merida.) If the film is getting so much press for attempting to present a strong story for little girls about courage and adventure, then that is indicating a problem. 2) The mediocrity of Brave and the dissatisfaction audiences are reporting indicate a lack of imagination when it comes to entertainment for/about girls. Why was it so hard to come up with a story without defaulting to the princess craze? Why can’t we imagine adventures for Merida without them being bound to teen angst and mama drama? Can we also do it without her main concern being planning or avoiding a wedding? In a way this movie is the Scottish Pocahontas crossed with Freaky Friday. Brave is a first step, but next time let’s think less about how to cater to an audience of little girls and stop treating female characters like they are some sort of impossible commodity and just tell a damn good story with a female lead who is human, and badass, and complex. We can do it. There’s so many issues I’d like to get into about this film, but not enough space/time. What are your thoughts? Let’s discuss! On a related note: read a great debate regarding strong females in sci-fi and how a “strong female” is often considered STRONG because she lack femininity. Perhaps Merida could have been the blacksmith’s daughter (to keep the horses) and her mother could be a healing woman…who uses strange methods. The village tolerates her for her husband (and her skills, even though they’re afraid and won’t admit it) but they all see her as a sort of outcast/with in training. Merida could be all-you’re embarrassing me in front of the others, I don’t want to learn this herbcraft anymore, why don’t you stop that-can’t you see it makes others not like us? The crisis point for her could be a prank where they call Merida a witch/witch-in-training and leave her upset and humiliated in an area where witches are thought to be. Then, when she found the witch’s house Merida could be, “Well, they think I’m one anyway-I might as well use a real witch for my side!” Then asking for her mother to change would be less irresponsible, if still largely selfish. Merida could see the bigger picture “stakes” by seeing someone dying without her mother’s care/something similar when the bear-woman can’t help out in her specialized ways. Merida’s “fate” or growing up could be that she realizes she can fill the role her mother does in the community, even if she wants to develop her own special techniques/ways. What do you think? Did I fall to another cliche trap with that? I wrote my thoughts on Brave as it was on my blog already, but this information about them not knowing a way to make a girl have real stakes in society without being a princess kept sticking in my craw til I came up with an alternative plotline that could contain the same mother/daughter and bear stuff without marriage or princesshood. I like it! Please send your CV to Disney! 😉 The witch/healing aspect could be done in a cliched way, but given the ongoing debate about the validity of women’s traditions (I’m thinking of Clarissa Pinkola Estes’s Women Who Run with the Wolves, for example) it could also be *fantastic*. I love it! It would be great to see “witches” as healers in a children’s film! The only young girl character that Pixar has created that has resonated with me, so far (seeing as how she is one of the only ones) is Violet from The Incredibles. Whenever I try to talk about her as a heroine, however, I am reminded that she is only a supporting character, which is true, but she is so dynamic and realistic. She changes not just for herself but for her family. She is not a princess; in fact, she has low self-esteem. Also, The Incredibles is unique for a Disney/Pixar film in that it is one of the few movies in which the mother isn’t dead, on the periphery (Sleeping Beauty’s mother didn’t even have a name), or actively keeping the child from reaching his/her goals. That is another rant, though. Violet Parr, as a supporting character, has more strength and empathy than Merida, the main character of Brave. I would love to see more analysis of her!